Responsive design – Hot Topix adjusts its layout based on the device it is being viewed on. This means the theme’s content will be easy to read and easy to navigate whether it is being viewed on a desktop computer, a tablet or a mobile device. Featured Posts on Category Pages – No more boring category pages with a list of the most recent posts. 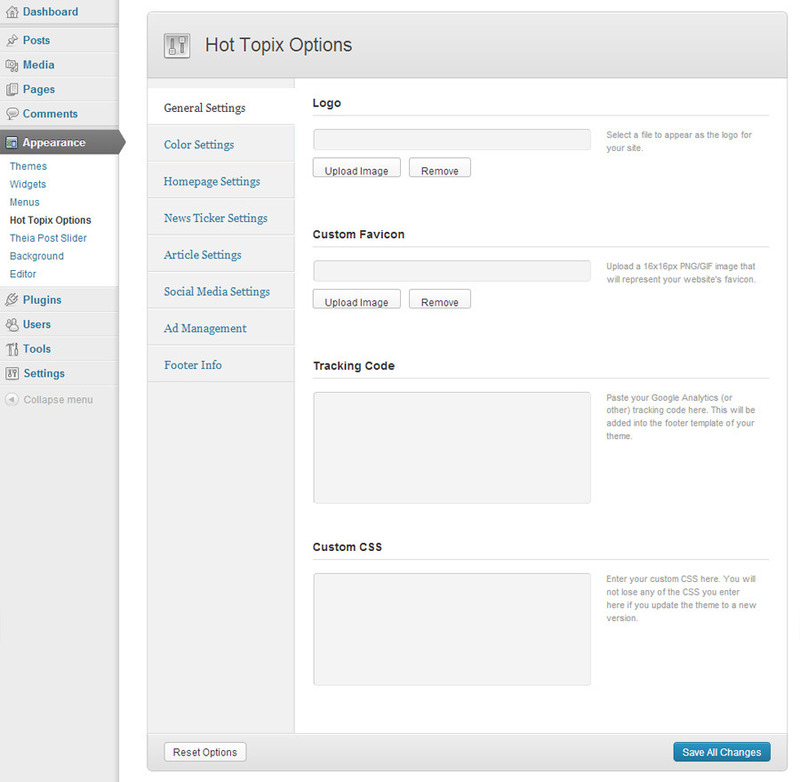 Hot Topix prominently displays the 5 most recent posts so your category pages look as professional as the homepage! 4 Different Ad Units – Hot Topix takes full advantage of available ad space to give you 5 different ad units, including a rare wallpaper ad and a special ad unit for mobile devices! The ad units include a 970×90 leaderboard ad (which can also be used as a 728×90 ad banner), a wallpaper ad, and unlimited 300×250 and 160×600 ads. 10 Custom Widgets – From a custom carousel widget that displays your content prominently on the homepage to a custom tabber widget that displays popular posts, Hot Topix gives you the flexibility and ease of use to display your content the way you want it without altering any code. This is an excellent theme. Super-great and fast support. Five Stars. I purchased this theme and it does everything advertised and more. The coding is well done, it works error free with quite a number of plug-ins that I am running and the finished product is well worth the investment. The support is top notch and I would definitely recommend this template and this author. I am a professional designer. I used to use themes for clients, but none ever had what I wanted, so I started to create my own from scratch. However, I have a personal blog site that I run, and I wanted a magazine theme that would fit my needs. Let me make this clear. I HAVE DOWNLOADED OVER 100 THEMES from theme forest. Each come with it’s own complications. This theme is BY FAR, the easiest to implement, and the best looking. It’s SIMPLE to make changes to it (php, css knowledge of course), and it’s a great, great, great SOLID theme. I can’t tell you how many times I have run across themes with such complicated php that you can’t do ANYTHING with it. THIS THEME IS NOT THAT CASE. Out of the box, it just WORKS. If you are looking for a theme that works out of the box, OR one that you can customize, THIS THEME IS IT. I cannot stress enough how happy I am with this purchase. NICE JOB. I highly recommend purchasing this theme or any from MVP. Great themes and awesome support. Keep up the great work ! MVP Themes takes pride in its support! If you have any questions related to the setup of Hot Topix that are not covered by the theme documentation or if you run into any bugs with the theme, please submit a ticket at the MVP Themes Support Center. 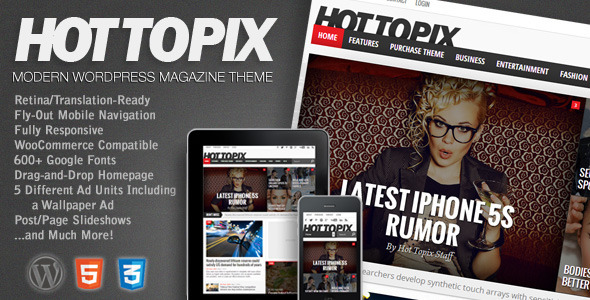 Unfortunately, MVP Themes cannot perform customization work for each of our customers, so Hot Topix comes “as-is”. Any customization you would like to make to the theme outside of fixing bugs will need to be done by you or a third party. Adds (optional) Fly-Out Mobile/Tablet Navigation via Menufication plugin, which is now included in the theme. Posts in Featured Posts section are no longer duplicated below the section in the Homepage Blog Layout . Updates Theia Post Sldier to latest version (1.1.7). Makes minor bug fix to CSS. Fixes issue affecting customers with a very large number of Tags (10,000+) that caused a heavy load on the server.